Thailand is one of my favourite countries in South East Asia to travel around – the culture, the cuisine and the organised chaos all combine to make one of the most popular spots for a range of backpackers and travellers from all over the globe – from the party island of South Thailand to the wild jungle of North Thailand. I must admit though that I tend to spend much more time in spots like Phi Phi and Koh Tao than I do amongst the north of Thailand and the cities! I’m a beach bum through and through so my travel plans tend to be filled more with beaches than hustle and bustle! At 2,565 meters in height Doi Inthanon is Thailand’s tallest mountain. 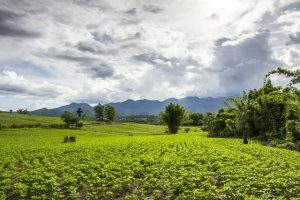 With an average temperature of only 6 degrees Celsius, the cool fresh climate conditions up here are in a complete contrast to the hot humid weather in the city of Chiang Mai. The 50 kilometer road which winds up the mountain side from the park gates to the mountain top passes through small villages, temperate forest and some amazing not-to-miss waterfalls such as Namtok Mae Ya and Namtok Wachirathan. At the top of this road the mountain provides an amazing lookout over the valley below. The iconic peak where you can lookout over an ocean of clouds smothering the jungles of Laos in the valley below. Phu Chi Fah has become a hit destination for Thai tourists over the past few years. Getting out here can be a bit tough and is best achieved with private transportation (car or motorbike), however the three hour journey from the town of Chiang Rai definitely pays off. Reserve at least 2 days to see Phu Chi Fah properly as you’ll want to be at the peak in the early hours of the morning before sunrise. Later in the morning the clouds tend to rise and block any view of the valley below. Lying discretely to north of Chiang Mai and not far from the border of Myanmar is the small town of Fang. 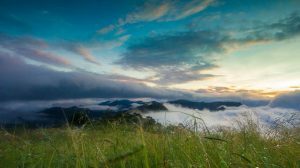 This lesser traveled destination offers the beautiful landscape scenery of the Doi Pha Hom Pok National Park which sprawls over the steep mountain ranges and is home to the Fang Hot Springs. Spend a weekend out here in the cool winter climate soaking in the naturally heated water for an almost Japanese style mountain retreat. A sleepy ancient city located up in the area known as the Golden Triangle. Chiang Saen is a similar destination to the ancient cities of Ayutthaya or Sukhothai, but a lot less crowded. 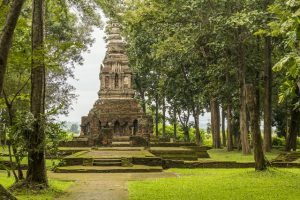 The city of Chiang Saen is scattered with smaller temples and Chedis in amongst the jungle, with the entire area being surrounded by an ancient wall. Head north from Phu Chi Fah to Chiang Saen along the small winding mountain roads to make a three day loop trail in the far north eastern corner of Thailand. Pu Kaeng Waterfall is definitely one of the lesser documented attractions in the north of Thailand but compared to the beauty of the Kuang Si Falls in Laos (commonly the Luang Prabang Falls). This amazing 9 tiered waterfall flows through thick green jungle which is accessed by only a small almost overgrown trail up the mountain. To get to the Pu Kaeng Waterfalls head south of Chiang Rai towards Phayao for 58 kilometers, or about one hour. This former sleepy village has these days become the hippy going town of Thailand and commonly associated with the saying “plan for 2 days, stay for 2 weeks.” When going to Pai don’t try to plan too much out there are plenty of amazing travelers who are eager to drag you off to their favorite destinations such as Pembok Waterfall or the Pai Canyon. Another popular activity for travelers going to Pai is to hire a motorbike in Chiang Mai and ride the 135 kilometer road of 762 turns through the mountains, however it’s best to have some riding experience before you tackle this one. As a huge waterfall fan this is another destination I just have to throw in. Khun Korn Waterfall is the tallest waterfall in Chiang Rai Province reaching a staggering 70 meters. 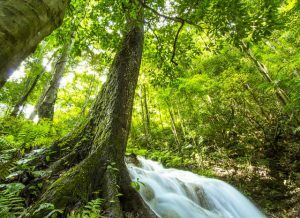 The waterfall is located only 30 kilometers outside of Chiang Rai town followed by an easy 1.4 kilometer trek through the jungle along a well-trodden path. The waterfall flows fairly strong with a huge amount of spray coming off towards the walking track. Showering under the waterfall is possible but probably not recommended during the wet season. Have you been to Northern Thailand? Any spots you’d recommend checking out? Josh Shephard is an independent travel photographer based in Bangkok, Thailand. He has been exploring the islands, mountains and motorbike trails of Southeast Asia since 2013, uncovering unique places that you’ve otherwise never heard of. Check out his Southeast Asia travel blog for more of his adventures. these are amazing destination of Thailand. these have so much beauty for adventuring. we can get fun here with family. Chiang Saen is looking very beautiful place and best place for holidays.